The combination of a snow day and the presence of extra sour cream in the refrigerator can be a dangerous thing. It can lead to the making of decadent treats. 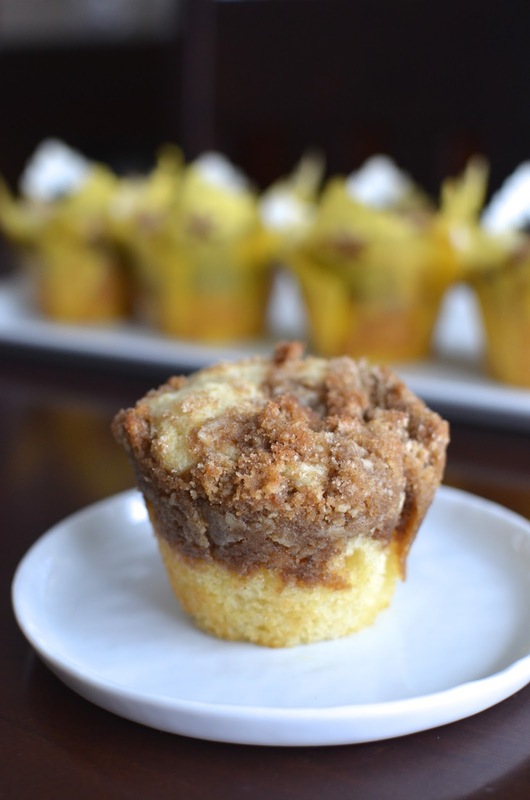 For me, it led to the making of these "super-streusel" muffins a couple of weeks ago. I think our winter started off pretty calmly...after last year's relentlessly long winter and countless snow storms, I initially thought that maybe we would be lucky this year. Looking at it now, it seems we just had a late start! We've had our share of snow, a couple of snow days/school closings, and in general, it has been extremely cold and icy out. All that said, I'm really grateful we haven't had issues with power outages like we did a couple of years ago. It's hard to complain when you're warm and toasty in your own home. The cold leads me - and keeps me - in the kitchen, and it seems to be making us hungry all the time! During a snow day, we seem to be doing the following on repeat: cook-eat-shovel. I can barely keep up with my fellas' appetites! But with all the calories we're burning from snow-shoveling, I think we can handle some hearty meals and a few sweet treats. And these muffins were one of the sweet treats I baked during the last snow day. I had leftover sour cream after making the mini chocolate bundt cakes. Since sour cream always makes me think of coffee cakes, it's no surprise I ended up here with what I'm calling "super-streusel" muffins. I call them that because these muffins are loaded with streusel/crumb topping - the ratio of muffin to streusel topping is almost 1 to 1. No one's going to complain about insufficient streusel here! This recipe I used was intended for large, or jumbo, muffins. Since I don't have a jumbo muffin tin, I improvised. I used my regular-size muffin tin and set tall paper baking cups within the openings. This gave me the height I needed to imbed all that streusel-goodness within. I bought these paper cups eons ago (they must have been on sale) and I'm happy I finally had a reason to use them. Alternatively, you could buy and use similar tall parchment cups or make your own! Instead of following the recipe and doing a layering of streusel in the middle of the muffins and then placing more on top (which would work better if you had the jumbo tin), I kept all the streusel on top of the muffin batter. To get it all on there, I lightly pressed some of the streusel on top of the batter first and then topped them off with more. The cake itself is super moist and fluffy, the topping is simply sweet and crunchy. Frankly, these muffins have many of the elements that provide you with an express route to goodness in baked goods: butter, sugar, sour cream...It's full-on muffin indulgence for a snow day! With all this streusel business, I want to reach out to any streusel-experts out there with a question. Not having much experience, I always thought I preferred making streusel or crumb topping with cold butter - the type where you cut small pieces of cold butter into your brown sugar and flour mixture. That's how this recipe goes. But after doing it this time and thinking longer on it, I now feel like the melted butter method might work better. It seems easier to stir in melted butter to get even clumps. Is there any particular reason to do it one way or another? What's your preference, if you have one? I am just thinking/questioning out loud but any thoughts would be interesting and appreciated! I made a small batch (half-dozen) of these muffins. I might need a snow day - and intense snow shoveling - to justify making and eating them again! I'm not exactly eager for any snow storms or snow days so I'm not sure when we'll be enjoying these super muffins again. I do know that snow days do come with its set of perks, treats like these being one of them! 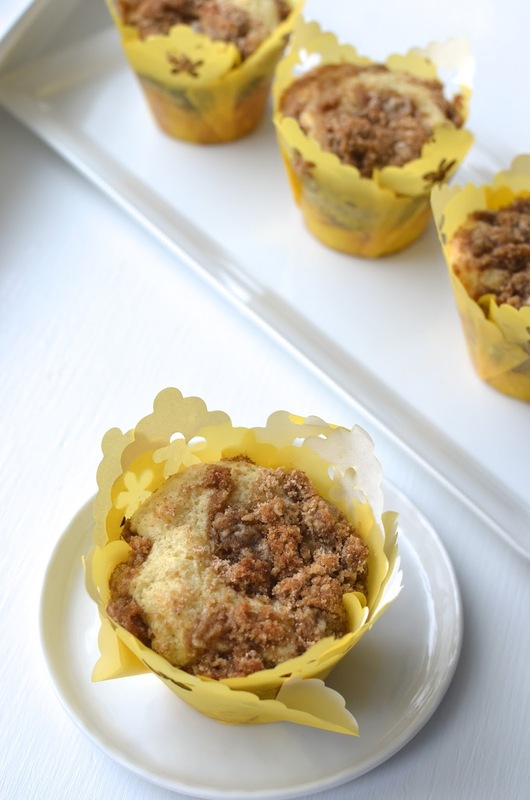 *You will need tall paper baking cups for this recipe to hold in the abundant streusel topping. You can see instructions for making your own parchment baking cups here. Make streusel topping: Stir brown sugar, flour, salt, and cinnamon together in a medium bowl. Using a pastry cutter or two knives, cut in the butter until mixture resembles coarse crumbs. Set in the refrigerator until ready to use. Make muffins: Preheat oven to 350 degrees. Place tall paper baking cups* (such as parchment baking cups) into 6 cups of a regular-size muffin tin. In a small bowl, whisk together the flour, baking powder, baking soda, and salt. Place butter, sour cream, granulated sugar and vanilla into the bowl of a stand mixer and beat together on medium-speed until light and fluffy. Beat in egg until combined. Scrape the bottom and sides of the bowl. On low-speed, beat in the flour mixture until just incorporated. Divide muffin batter into the 6 prepared muffin cups. Top muffins with half the streusel topping. Gently press the topping down slightly into the batter. Then top with remaining streusel (it will look like a lot of streusel topping). Bake until golden brown and a cake tester inserted into the muffins comes out clean, about 20 minutes. Let muffins cool in pan, on a wire rack, for about 5 minutes. Remove from the muffin tins and let cool completely on wire rack. I have a weakness for anything streusel! The texture of muffins is perfect, Monica. I know what you mean...streusel is one of those things that many of us have a weakness for, I think! There is MEGA streusel on these! Which is a good thing because the streusel is the best part! Oh my gosh, these are the perfect muffins, Monica! Look at the glorious height of that streusel! My favorite! <3 these! You know we love ourselves some crumb topping, Kelly! : ) I wondered if you have a preference for the cold vs. wet method? Need some sun, too! Thanks! You did it now! I could shovel our already shoveled driveway just to justify making and eating these. They look wonderful! I am not sure about the melted or cold but I would think melted butter would be less chunky in the beginning. Cold butter would leave some clumps on top? Just a thought - but who cares - extra streusel topping is the way to go obviously! haha - I love it, Tricia. You're so right - who cares as long as it tastes good. I just wonder if I'll get bigger clumps with one method vs. another. Anyway, you stay warm. Wish I had your cookies right now! I know what you mean! After last winter, anything would seem better - but this one is starting to look pretty long. I'd love these muffins, no matter what it was doing outside. Hi Monica, love these streusel muffins, they look perfect inside. Look at that streusel!!! I love it! You know, now that you mention it, I actually think I like the melted butter method better too. I've never really thought much about it before but it does seem to work better at getting good clumps! At least in my experience! Streusel flavored and scented with tea or herbs?! Love the way your mind works! I wish I could experiment a little more but my little one is not too adventurous (admittedly, I'm something of a traditionalist too) but I love seeing others' creativity. ; ) It is freezing here for sure...snow tomorrow and then something of a temporary thaw on Sunday. Looking forward to that! Thank you for the melted butter method! I love your muffins! They look terrific! I've done crumb topping with liquid fat (oil) and the cold butter. I don't know which is better though lately, I'm thinking the melted for whatever reason. But no matter, you end up with something tasty...we're talking butter and brown sugar, right! These look so soft and flaky. I just want to eat some right now! The muffins are so moist...that sour cream is magic. I am absolutely LOVING what the sour cream has done to these muffins! I just cannot stop looking at that muffin that's been cut into a half! I want to sink my teeth into it! And there are no two ways about streusel topping! NOTHING can compete with that goodness! <3 LOVEEEEE it! Cold weather triggers my appetite big time too, especially in the morning, and these little muffins are just the kind of thing I crave with my cup of coffee! Yes, we keep blaming it on this cold! That has to be it, right?! These are definitely perfect with a hot cup of coffee at midday (snow-shoveling optional). I love the streusel to muffin ratio here- you can't have too much streusel, in my opinion. ;) These look great! We have had plenty of snow days here to go around - no more! LOL love the muffins! After spending yesterday morning helping shovel some 7 inches of heavy snow and dealing with a few hours without power, I am so ready for Spring! I love the name of your super lovely muffins. The more streusel the better! I generally use room temperature or cold butter to form the bigger clumps and I always use my hands to make the crumble. That way you can quickly form clumps according to your desire. Another way to get a nice crumble is to mix everything together, then cut into large cubes. Freeze the cubes and then run it through the processor for a few seconds to get a chunkier streusel. It's a long process but the texture is amazing! Thanks so much, Sonali. I love reading your methods! I was just reading somewhere else yesterday that it's good to take cold butter but zap it in the microwave 10 seconds. That way, it's cold but soft enough to blend. I think we are all after as much crumble as possible! And no snow, ever?! I remember the first time I saw snow when we moved from HK to the US. At this point, I've had so much experience, I can tell you you're not missing much! Enjoy the sun in lovely Sydney! I really feel for all of you who are shoveling snow and snowed in. But, the perks of that are some of these awesome baking goodies and family time. Well anyways, I love both. Warm hugs from sunny San Francisco. Any way you melt it - or not - crumb/buttery topping is hard to resist. I am convinced it's good either way! Using clarified butter, having that around for cooking, must be great. Enjoy your sunny SF. I'm jealous. Wow! Look at that beautiful streusel; I like your snow day schedule, with lots of good food after that snow shoveling (: I bet these muffins would be fantastic as jumbo muffins as well! Be still my heart! I'm a sucker for anything muffin or streusel so these are calling out to me!! What a lovely imagine of warmth and color you've got me thinking of, Nami! I think my husband and I seriously need to move someplace warmer (or at least someplace with more moderate temp patterns) when we retire! : ) Intense cold and snow is leading to heavy-duty baking as you can see. Ahh....I am jealous of you in a very good way. Enjoy it! when it's cold and dreary out, I run to the kitchen too, to bake my face off (and then eat everything i baked; it's such a blessing and a curse, really). these are the prettiest things! and I feel like i can smell their warmth and cozy streusel smell from here. i love them.